Nikon Metrology announces the release of Focus 2019. This latest version of Focus laser scanning software introduces new and improved features. These features include improved alignment workflow, advanced 3D graphics engine and extended GD&T functions, such as “Surface profile per unit” tolerance to identify local imperfections on surfaces and “Runout” tolerance, typically used on cylindrical features. The workflow for activating and switching between alignments is now much easier. Performing the alignment of the measured data to the CAD model or part coordinate system, is one of the most critical tasks in the inspection process: any mistake in the alignment will negatively impact the inspection results. In Focus 2019 the workflow for activating and switching between alignments has been made much easier. Applying different alignments to measured data is now fully managed by the software, eliminating the risk for a user to end up with inconsistent data or data sets expressed in an incorrect alignment. Users can now create alignments without having to worry about which objects the alignment needs to be applied to: alignments will now be consistently applied to all measured data. Switching between alignments can be done easily by activating an alignment from a right-click menu. Also when collecting scan data, via handheld scanning or CMM scanning, the measured data will automatically be converted to the currently active alignment. Shadowing effect for more realistic visualization of objects in the 3D scene. The 3D scene in the Focus software can be considered as the heart of the software: it is used to visualize measured data and nominal models, to interactively inspect parts and create graphical inspection reports that say more than words in a textual report. Focus 2019 has now been upgraded with a state-of-the-art 3D graphics engine that makes full use of the capabilities of the graphics card in the PC to improve the visualization performance. Furthermore, it features tools that will improve the visual experience such as smoother display of edges, physically correct display of transparency and intersections of objects and a shadowing effect for more realistic visualization of objects in the 3D scene. Find out more about Focus software here. 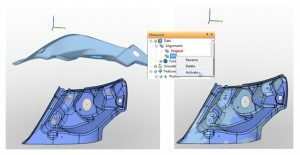 One of the key benefits of laser scanners is the ability to quickly inspect freeform shapes and visualize deviations in an easy-to-interpret way. As such, when a designer puts a “surface profile” GD&T tolerance on a part, a laser scanner is the ideal tool to inspect this tolerance. Focus already supported the analysis of Surface Profile GD&T tolerances, but now the functionality has been extended to also support the analysis of Surface profile per unit tolerances. This allows finding local imperfections on surfaces that could impact the correct functioning of the part. Another GD&T tolerance that can be evaluated now in Focus is the Runout tolerance. With this release, it is now possible to evaluate both Circular Runout and Total Runout. These tolerances can be evaluated on cylindrical features, which is the most common use case, but they can also be evaluated on planar features. Take a closer looks at Nikon Metrology’s Laser Scanning solutions.